This supersize beach towel is luxurious soft to the touch velour cotton in a generous extra large size and bright aqua blue colour. 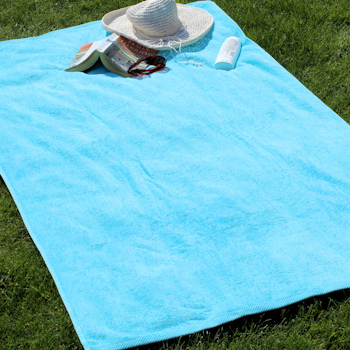 This supersize beach towel is luxurious soft to the touch velour cotton in a generous extra large size and bright aqua blue colour. You can choose to have a name or initials custom embroidered along the bottom in your choice of thread colour and letter style. Treat that special person to a very unique and personal gift. Treat that special person to a very unique and personal gift. Great for that next holiday or also suited to use at the gym, health spa or pool. Personalised beach towels are popular gifts for birthdays, weddings, honeymoons or anniversary gifts and even a great housewarming gift. Made to order with personalised embroidery. This beach towel is 100 percent soft velour finish cotton. With a quality rating no less than 500gsm. Larger than a bath sheet making it perfect for the beach or lounger. Enter what name you would like embroidered and select a thread colour for it to be sewn in. We use the largest lettering for the length of the name we can. A personalised towel makes a great gift with that added unique touch!